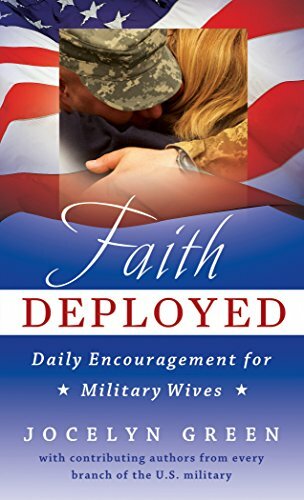 I think the title of the newest book by Jocelyn Green "Faith Deployed: Daily Encouragement for Military Wives" really sums up the content and the purpose of her book. However, I think it is not just for wives and could just as well be for husbands with spouses overseas, or mothers and fathers and even children. There are some fundamental truths and thoughts through the book that lends it to a great audience of readers. And that is my only negative comment about a delightful and much need book. This book would make a great gift to give to those who have relatives overseas in the war areas or not. The book is heavy with biblical quotes and lots of real life advice from wives representing all the military branches of service. Green does a good job of weaving in her writing with those of the contributing writers to form a emotional and spiritual foundation from which the reader will find some inner strength and peace from. I highly recommend this book and suggest that all those who have any military connections buy a copy and keep it in your personal library. It is good insurance against all those worries that may grip you when you are waiting for your loved ones to return home. As a military wife, if you have ever felt overlooked and undernourished as you strive daily to meet the needs of everyone around you-in a culture that largely does not understand your stressful lifestyle-this book is for you. Faith Deployed: Daily Encouragement for Military Wives is not a guide to long-distance relationships or a how-to on navigating through the military culture. It does not offer "ten easy steps" for an easier, painless life. Instead, through squarely addressing the challenges you face, Faith Deployed will equip you to respond biblically to the daily struggles that threaten to wear you down. The book is written by 15 Christian military wives from all branches of service.